i) doing the same thing over and over and expecting different results, ii) deviating from social norms or iii) becoming a danger to one’s self and others (although it’s generally agreed that being a deviant or a danger does not always stem from being insane). 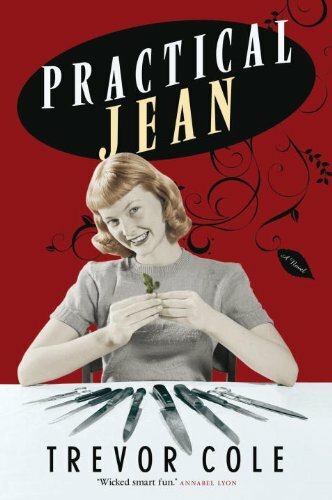 It may also be agreed that Jean Vale Horemarsh, the protagonist in Trevor Cole’s Practical Jean—given her quest to kill her four closest friends—falls bang into the second category. Please don’t misunderstand; she’s doing it out of love. She’s doing it because she doesn’t want them to suffer old age and disease the way her mother did; she wants them to go out in a moment of bliss. Which brings us to the second part of her quest: determining what would constitute a unique moment of bliss for each of the women, then making that moment happen. Then knocking them off. Which brings me to an interesting, possibly worthwhile, point of digression: can men ‘write women’ effectively, and vice versa? I think: yes, they can. Not all, but those who do it well (Richard B. Wright’s Clara Callan comes to mind), can be enlightening if only for the insight ‘the other’ receives in the reading. In fact, if handled with a deft and sensitive hand, the result is a little like looking into a mirror, being slightly startled and immediately wanting to blame the lighting, but then realizing that, yes, that is indeed us, with our dark circles and bad haircut. She said nothing, didn’t even look up, so Jean knew something was wrong and thought maybe Cheryl was mad at her. For what she couldn’t imagine, unless it was forgetting to say something nice about the turquoise barrette in Cheryl’s hair. That seemed like such a petty thing to be mad about, but Jean thought that was probably it. Cheryl could be a little sensitive sometimes; it was one of the few things about Cheryl that wasn’t so great. Cheryl lifted her glistening face from her hands and bawled out, I’m pregnant! This simple moment carries a lot of weight, not only as a turning point in their lives, but as a through line in the book. Jean immediately drops Cheryl as a friend; soon after, Cheryl and her family disappear. Decades later, Jean’s guilt resurfaces and she’s desperate to find Cheryl, to atone for her lack of compassion. By killing her of course. The other remarkable thing in this book so focused on death is that Cole manages, without cliché, to maintain a very high, very subtle, level of humour via spot-on takes of various relationships, letting us in on the power of memories, the dynamics created by conflicting emotions, things said and unsaid—all of the sad mad truth of everyday lives. And all of it perfectly placed against an insane backdrop of benevolent murder. Somehow the suspension of disbelief is complete. Dark, delicious and very discussable; best read with a few good (but not too good) friends and a little good (very good) dark chocolate. This post first appeared in July, 2011. Perhaps it’s time to start a Peek Freans Book Club.